July 24, 2015: When I received some intel Thursday afternoon about an F-4 stopping by for some fuel early the next morning I had a strong suspicion as to which one it might be and did not want to miss it for anything. I arrived at Farley Road on the north side of the field around 0645 and set up for traffic arrival on 17R. About 0720 here it came on a straight in approach with one engine smoking…….classic Phantom. WOW! Just as I had suspected (more like really hoped) it was Tyndall’s 53 WEG (Weapons Evaluation Group) flagship. Man, was I so happy to catch it. Not just because it was a Phantom (my first true aircraft love), but I was a witness to history…………the end of an era for Tyndall. 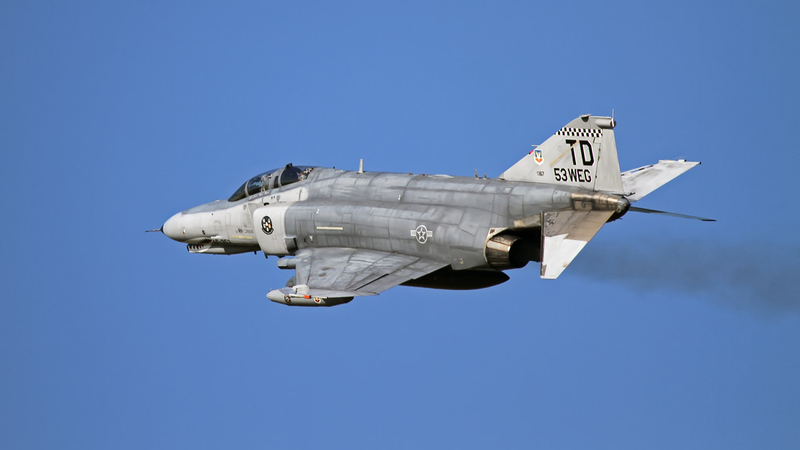 This was their very last Phantom (QF-4E, 73-1167) on its way to Holloman AFB, NM as they begin to receive more QF-16s. After it landed I drove around to the airfield to get a few static shots. Taking them was very tough as the Phantom was extremely back-lit. No matter what, though, I was determined to take a couple of shots no matter what. This could very well be my last time to see a Phantom and I was not about to give up. After it was fueled up I drove around to dirt service road on the east side of the base to catch its departure.